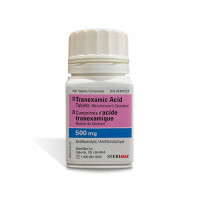 Tranexamic Acid Tablets | SteriMax Inc. Hereditary angioneurotic oedema. Increased local fibrinolysis when the diagnosis is indicative of hyperfibrinolysis, as with conization of the cervix, dental extraction in patients with coagulopathies (in conjunction with antihaemophilic factor) epistaxis, hyphaema, and menorrhagia (hypermenorrhea).